West Ham United are to leave their Upton Park home - officially known as the Boleyn Ground - after 112 years. 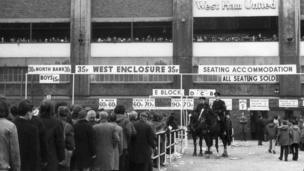 Here are some of the best photographs of their time at the famous ground. 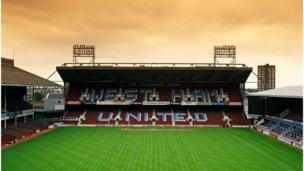 West Ham will vacate Upton Park this summer, when the site will be redeveloped as housing, retail and leisure facilities. The club moved to the stadium for the start of the 1904/05 season. 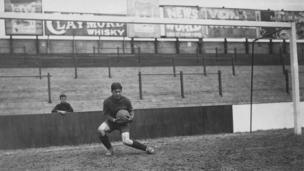 Pictured here is England goalkeeper Arthur Edward Hufton in 1921. West Ham's first game at their new home was against Millwall on 1 September 1904. 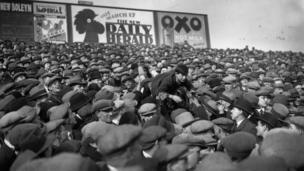 Here fans at a game on 1 March 1930, pass a young boy to the front of the stand. 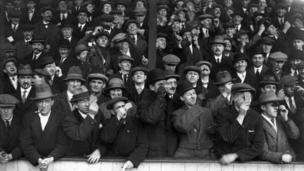 Fans watching West Ham play Aston Villa on 4 April 1936 view a solar eclipse during play. The ground was later bombed during World War 2, causing severe damage. 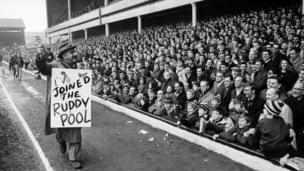 Warren Mitchell, star of TV's Till Death Us Do Part, entertained the West Ham crowd during a match in February 1968. His character Alf Garnett was famously a fan of the 'Ammers - although Mitchell himself was a Tottenham supporter. 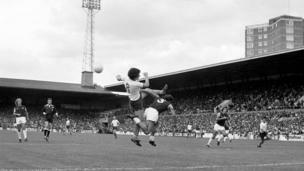 The ground played host to Bobby Moore's debut. 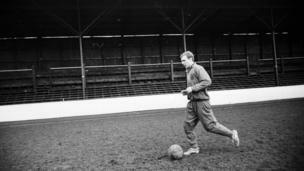 Moore - the England captain who lifted the World Cup in 1966 - is pictured here training on his home ground, in January 1965. 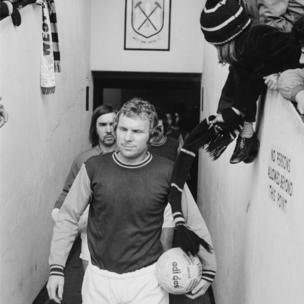 Bobby Moore was appointed West Ham captain just a week after his 21st birthday and became its most legendary star. Here he is pictured leading out the team before his final match for the club - a reserve team match v Plymouth on 9 March 1974. He joined Fulham five days later. Upton Park - pictured here in 1975 - has a record league attendance of 42,322, for a Division One match with Tottenham Hotspur in 17 October 1970. The match finished 2-2. England's 1966 World Cup final hat-trick hero Geoff Hurst is another famous West Ham player. 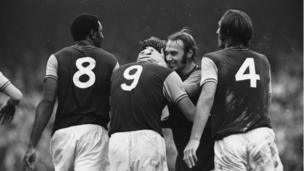 Here he is being hugged after scoring against Leicester City. 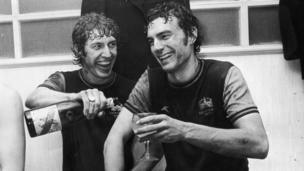 Champagne nights arrived at Upton Park during the time of club legend Trevor Brooking, who later became Sir Trevor. He scored two second-half goals in the second leg of the 1976 European Cup Winners Cup semi-final win over Eintracht Frankfurt, played on a particularly boggy Boleyn Ground pitch. 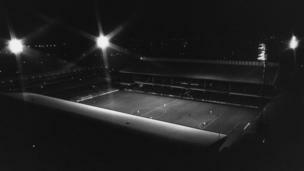 Upton Park, pictured here under floodlights in October 1980, will host its 2,398th and final West Ham match when the players line up against Manchester United. 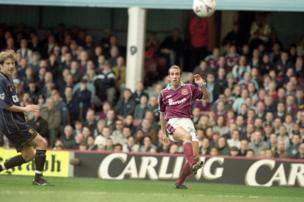 The ground witnessed many famous moments, including Italian striker Paolo Di Canio's spectacular volley in 2000 - which later came second in a BBC poll of the best goals of the last 50 years. 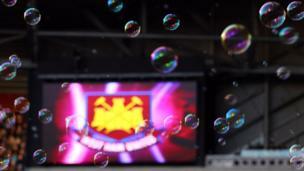 Bubbles, seen before a match between West Ham United and Coventry City, have become synonymous with ground, in recognition to the club's anthem I'm Forever Blowing Bubbles. 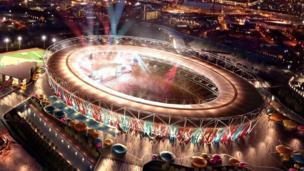 The club will move to the 2012 London Olympics Stadium, which is being redeveloped for the team's arrival.